I have to admit to being anxious to get the Music Hall MMF-2 out of its box and running. My reason was easy to understand given my past experiences with inexpensive and fine-performing turntables endorsed by Roy "Music" Hall, the US importer of such fine British hi-fi product lines as Creek, Epos, and Goldring. In 1990, I got to take a close look at the most affordable table from the now-defunct Revolver line up, the Rebel, which Music Hall was importing at the time. Now here comes a very affordable ($299.95) new turntable built in the Pro-Ject factory in the Czech Republic and bearing the Music Hall name. All this spelled "must hear" to me. The MMF-2 is a snap to install. Atop everything else inside the shipping carton is the clear plexi dust cover bearing a simple black rectangle in place of a standard logo. Next came the plinth itself, followed by the fairly heavy platter and the much lighter platter mat, packed separately at the very bottom. With everything now out of the shipping carton, I removed the two shipping lock-down screws from the motor mount on the table plinth, permitting the motor to float in its own suspension. Next came the drive belt, which I first slipped over the upper and smaller diameter of the two tiers machined on the motor pulley for 33 1/3-rpm play, and then around the outside of the composite sub-platter. There is a larger-diameter rim just beneath the 33 1/3 rim for 45-rpm playback. Next, I lowered the 4 1/2-pound cast platter over the composite sub-platter and adorned it with the provided felt-like black record mat. Now for the fun stuff. The small plastic shims inserted under the tonearm bearings for protection during shipment had apparently shaken loose during shipping, as they were lying loose on the plinth when I unpacked the turntable. Fishing the tonearm counter-weight out of the packing styrofoam, I threaded it onto the rear of the tonearm and adjusted it until the whole tonearm assembly floated perfectly level when unfettered. Zeroing the tracking-weight indicator ring on the counterweight came next. The indicator ring provided on the counterweight to be used to set final tracking weight was stunningly accurate, especially for such an inexpensive table. Setting the tonearm for the recommended 1.7 grams as indicated on the dial ring proved to be just a hair on the light side of dead on when referenced to my Shure stylus-force gauge. Being the obsessive-compulsive type, I made a quick check of the cartridge mounting position with my trusty DB Systems stylus protractor. Good thing too, as it revealed that the pre-mounted Goldring Elan, a moving-magnet cartridge with a 15-micron spherical stylus, was just a tad too far back in the headshell and canted slightly to the inside. 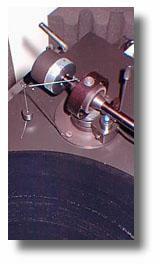 With that adjustment corrected, I threaded the monofilament line attached to the anti-skate weight through the floating formed wire pivot point and then attached it to the anti-skating rod above the tonearm at the second groove, as indicated in the owners manual. I have long disliked the spring-loaded anti-skate mechanisms usually found on inexpensive tables as they seem to be both rarely accurate and highly inconsistent in applied pressure during travel across the playing surface of the record. Of course, the gravity-type anti-skate offered on the MMF-2 is without a doubt less expensive to implement than a more complex spring-managed mechanism, which is likely the deciding reason that it is provided at this price point. But given that it is both less costly and more effective, why do so few others offer it? I was absolutely thrilled to discover that this turntable permits for fine adjustment of both vertical tracking angle (sometimes referred to as stylus rake angle) and azimuth. In fact, these were strong contributing reasons for my desire to look at the MMF-2. My biggest complaint with budget tables for years has been the inability to adjust the all-important cartridge tracking alignment. VTA adjustment allows for proper stylus aspect vertically in the groove from front to back, letting you set the angle at which the stylus traces the groove. Azimuth adjustment lets you make sure the stylus is tracking at right angles perpendicular to both groove walls to ensure proper left-to-right channel separation. Though neither adjustment offers any specific method of calibration like some more expensive entrants do, the mere fact that they are adjustable is sincerely welcomed on such a budget effort. The factory presets for both VTA and azimuth seemed to be dead on for the Goldring Elan already mounted in the headshell. This is the least expensive turntable Ive ever encountered that allows you such freedom of adjustment. Well done, Music Hall. The turntable plinth itself is one solid piece of wood suspended on four feet made of large coil springs terminated with rubber pads. These feet are not adjustable, so leveling must be accomplished in some other fashion. I simply shimmed under the four feet until the unit was true. The motor is set with its own suspension, but the platter bearing and tonearm rely on the four feet of the plinth for isolation. The power switch is semi-concealed under the front left front corner of the plinth, a nice touch actually. Were ready to rock. Dropping needle to groove for the first time, I was quite delighted to find that the cueing pot provides a rate of descent that is actually slow enough for lowering the tonearm onto the record safely. No manual assist is required to prevent the stylus from crashing down on the record, possibly damaging the stylus, cantilever or the record itself. Will this table ever run out of tricks and stop surprising me? Roy had assured me that about 30 hours of run in were all that would be required for this analog system to show its true colors. So I just put on some old favorites while writing and surfing the net (arent laptops cool?) and sat back for the first couple of days. You know, even right out of the box, with the cartridge suspension still stiff as could be, I liked this little guy. Given proper break in, the MMF-2 demonstrated a real feel for conveying the music. Oh, dont get me wrongit was far from perfect. The overall presentation was on the hard side, with octave-to-octave balance shifted somewhat clockwise due to a lightish low-frequency balance. Bass was somewhat sluggish and lean, not filled out in body and character. Treble was a bit tizzy and "white" in nature, somewhat lacking in decay, and the top octave was obviously slighted. Locations and individual instruments were frequently congested, especially under dynamic taxation. Vocals and mids in general were a bit pinched and exhibited a touch of a raspy, nasal quality. It was about this time that a little voice from over my right shoulder chided in with, "Hey, Greg, the whole rig, cart included, costs less than a single set of interconnects in your system right now! How bout lightening up and getting things in perspective, bro?" Good point. Ill go one better; even given its flaws, the MMF-2 was thoroughly engaging and astonishingly musical. Simply put, it rocked. With extended break in, bass got a tad deeper and a bit tighter, treble lost some of the whiteness and ragged edge, midrange flowed more liquidly, detail and focus increased while staging and imaging fleshed out nicely. The simple four-point spring suspension seemed to work well enough for isolating the deck from its own generated LF. It was, however, inadequate to keep footfalls and low F-18 fly-overs (no foolin, I live 17 miles from the largest naval air-warfare center on the East Coast) from stirring its dander and perhaps from reaching its best in terms of resolution and focus. That will be dealt with soon and easily enough. Now, those of you a bit more savvy in the analog arts may recognize that a good bit of what Im describing as flaws might be attributes of the cartridge. Hmmm. Lets synergize! Time for full battle gear. I placed the little devil atop one of my inner tube/shelf/sandbag platforms. Next, off with the dust cover to remove yet one more unnecessary point of entry for unwanted acoustical feedback. Wrapping the tonearm with the elasto-polymer wrap included with the Sumiko Analog Survival Kit offered yet another chance for damping resonance. All that was left to do was clamp the record down with my J. A. Michell reflex clamp. I DO NOT RECOMMEND using a mass-loading clamp unless it is included with your table as it may put an undue and damaging strain on your platters bearings. What a transformation! Tighter midbass, clearer and better-extended treble, better enunciation across the board, a bit more fine detail, super staging, better focused imagesmore oomph. Still a bit of congestion under dynamics, a lack of resolution of very fine detail and some leftover murky veiling. Just goes to show what a little synergizing can do. Finally, I reached into my bag of carts and dragged out the least expensive moving-coil I could find, the Monster Cable Alpha Genesis 500. Although no longer available, its bigger siblings, the Sigma Genesis 1000 ($399 from Audio Advisor) and 2000 ($599, same place)the latter my current reference cartridgeare. While this did help immensely with frequency extremes and to a lesser extent with the resolution difficulty, it did not catapult the table into the category of giant killer. Alas, the limits of the device were defined. What did you expect for $299? All told, it stands to prove that the platform itself is sound, no pun intended. Quite honestly, no turntable/tonearm/cartridge combo costing so little ever sounded so good. Classical fans who listen to large orchestral works may find this table/cart combo somewhat underwhelming as equipped. But this El Cheapo combo presents small chamber pieces, jazz, blues and all but the most powerful of rock recordings with a level of intimacy and pace unrivaled by any other "budget" turntable Ive ever heard. As factory equipped, the MMF-2 very definitely relates the feel and message of the music, even if it is a tad veiled and doesnt quite reach either frequency extreme. The midrange is much more musical than would be expected at this price point, and the unit exhibits so few major flaws that it easily becomes quite engaging. Factor in its unbelievable versatility, and this table is destined to become a budget classic. What the MMF-2 brings to the table is a group of desirable and useful features in a package that, though flawed, packs a sonic wallop that is unprecedented anywhere near its price range. The inclusion of truly useful features like the adjustable VTA and azimuth, gravity-managed anti-skate, two-speed playback, and useable rate-damped cueing, combined with the competent performance of the Goldring Elan cartridge, give this little upstart a price: performance ratio previously unavailable. So dust off those old LPs up in the attic and start groovin with this little overachiever. Those of you who have been putting off testing the waters of analog for fear that it was too costly have just lost your last excuse. With attention to detail and proper break in, the MMF-2 easily slays ANY digital source in the under-$500 market. It delves into the medium and retrieves an unbelievably sweet glimpse of the magic that those of us steeped in the analog tradition live for. Though it is a far cry from the last word in analog transcription, the MMF-2 rewrites the standard for the term "entry-level." This humble turntable is without question one of the best values going in one-stop analog shopping.